The preceding illustrations were based on the periodic inventory system. In other words, the ending inventory was counted and costs were assigned only at the end of the period. A more robust system is the perpetual system. With a perpetual system, a running count of goods on hand is maintained at all times. Modern information systems facilitate detailed perpetual cost tracking for those goods. 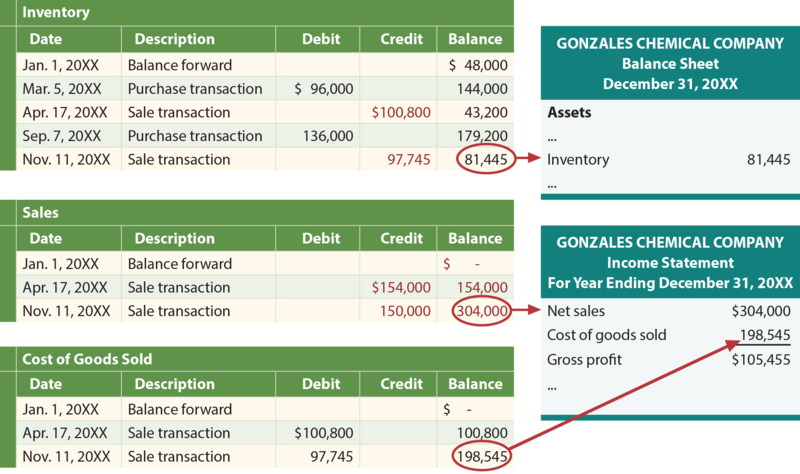 The following table reveals the FIFO application of the perpetual inventory system for Gonzales. Note that there is considerable detail in tracking inventory using a perpetual approach. Careful study is needed to discern exactly what is occurring on each date. 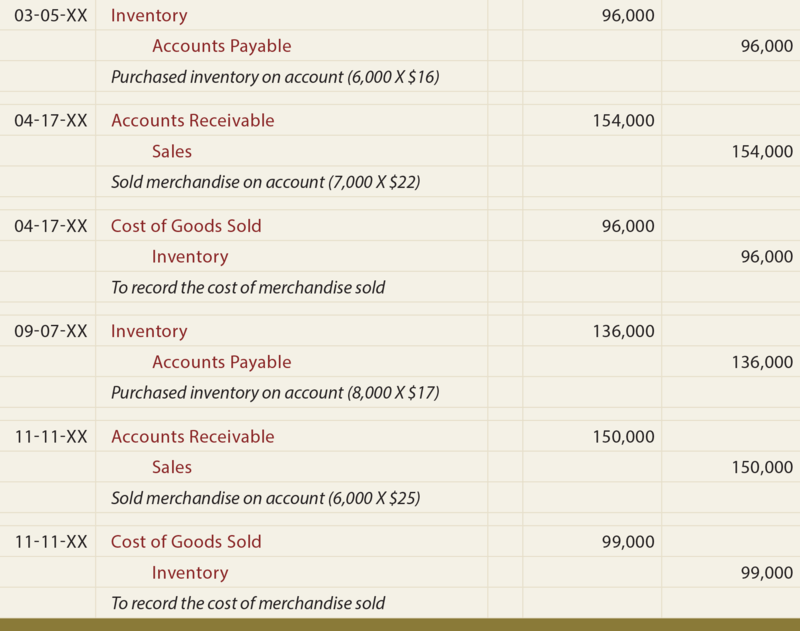 For example, look at April 17 and note that 3,000 units remain after selling 7,000 units. This is determined by looking at the preceding balance data on March 5 (consisting of 10,000 total units (4,000 + 6,000)), and removing 7,000 units as follows: all of the 4,000 unit layer, and 3,000 of the 6,000 unit layer. Remember, this is the FIFO application, so the layers are peeled away based on the chronological order of their creation. 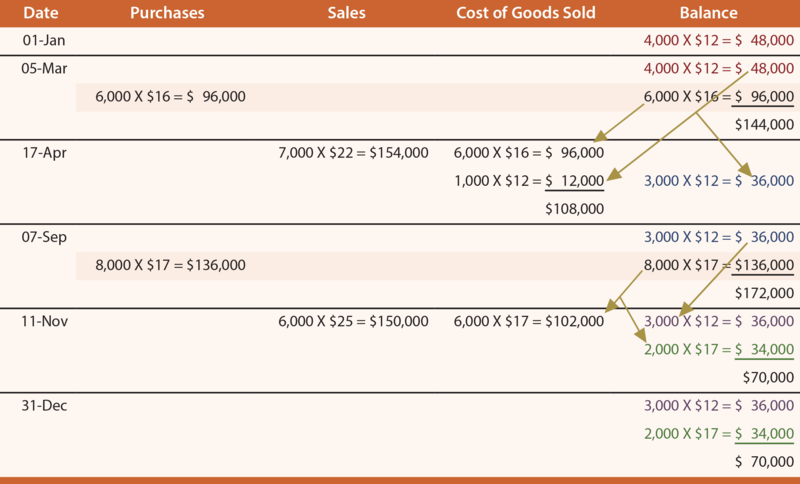 In essence, each purchase and sale transaction impacts the residual composition of the layers associated with the item of inventory. Observe that the financial statement results are the same as under the periodic FIFO approach introduced earlier. This is anticipated because the beginning inventory and early purchases are peeled away and charged to cost of goods sold in the same order, whether the associated calculations are done “as you go” (perpetual) or “at the end of the period” (periodic). 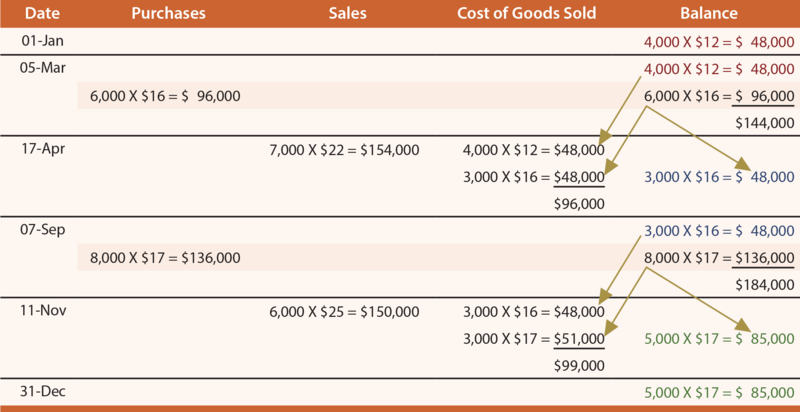 The following table, ledgers, and financial statements reveal the application of perpetual LIFO. Note that the results usually differ from the periodic LIFO approach. The journal entries are not repeated here but would be the same as with FIFO; only the amounts would change. The average method can be applied on a perpetual basis, earning it the name moving average. This technique is involved, as a new average unit cost must be computed with each purchase transaction. The following table, ledgers, and financial statements reveal the application of moving average. As with the periodic system, observe that the perpetual system also produced the lowest gross profit via LIFO, the highest with FIFO, and the moving-average fell in between. Distinguish between a periodic and a perpetual inventory system. 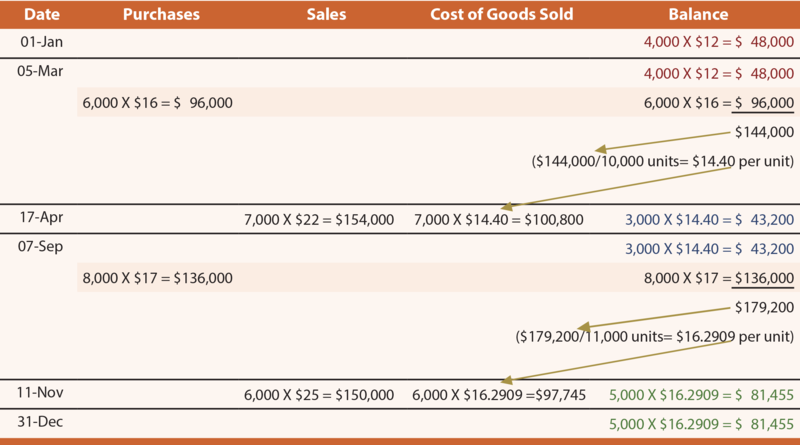 Calculate ending inventory and cost of goods sold under a perpetual system, using FIFO, LIFO, or moving average methods. Understand how the accounting records are updated with a perpetual system (versus a periodic system).